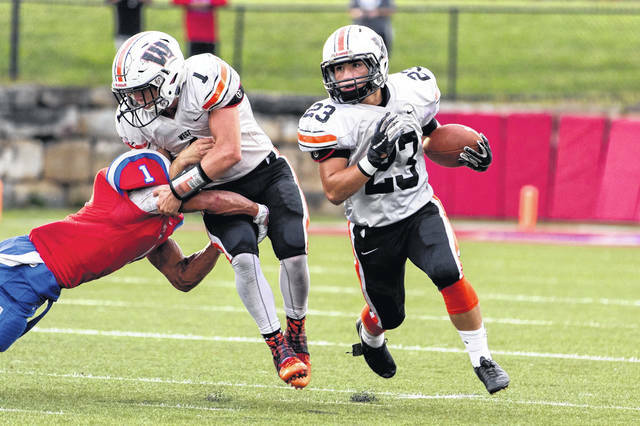 Senator senior running back Garrett Hurd will look to carry the offensive load against the reigning OVC champs, the Coal Grove Hornets. A host of Hornet defenders attempt to tackle Valley running back Gabe Streeter during last Friday’s comeback victory, 21-20. The week three matchup of the week features two of the best teams in the area from a year ago. The reigning OVC champs entering the 2018 season, the Coal Grove Hornets will travel west on US Highway 52 to take on the Portsmouth West Senators in the Senators first home game of the year. In their opening game of the season, the Portsmouth West Senators defeated the South Point Pointers 49-12, showcasing their dynamic rushing attack. Not only did they showcase how many variation of plays they can use to get into open space, but they used a number of players who were able to impact the game in their 49 point performance. In total, for their 49-12 victory, nine different players ran the ball at least one play. Five of those nine ran the ball at least three times. One of the leading rushers for the Senator attack was Cole Staggs, who carried the ball only three times but scored two touchdowns for 98 yards. Senior running back Garrett Hurd rushed for 41 yards on eleven carries and ran for two touchdowns in his team’s first game of his senior season. Wide receiver Josh Berry also carried the ball once for a big 51 yard gain in their victory. Three year starting quarterback and senior, Dylan Bradford, also contributed to their offensive production by throwing for 129 yards and two touchdowns on just three completions, and also by rushing for 41 yards on just three carries. 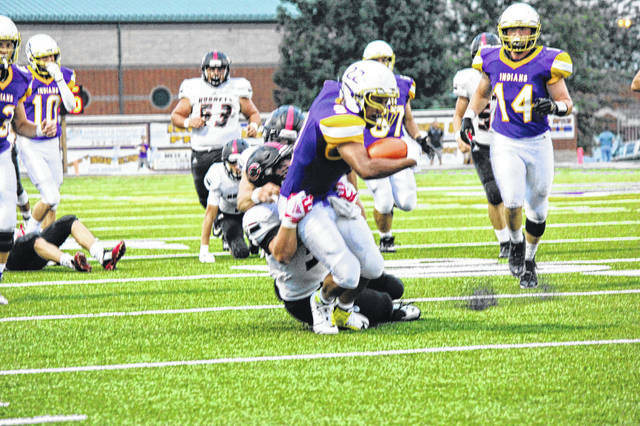 In their second straight road game to open the season, the Senators traveled to Trojan Coliseum to face the Portsmouth Trojans, a team riding high off their 57-40 road win in Lucasville over the Valley Indians in week one. The game plan was the same for West in their week two matchup, but the Trojans proved to be more apt to stopping the Senator rushing attack. They would not be able to completely stop them, however, as West would win the game 13-0 in a classic smash mouth football style game. The Senators opponent in their home opener of the 2018 season is the Coal Grove Hornets. The Hornets, who are the current reigning OVC champs, will travel to West Portsmouth with a 2-0 record after a week one road victory against River Valley 47-0, and a week two come from behind road win against the Valley Indians. The Hornets hope this years result against the Senators will differ from a year ago when West defeated Coal Grove in Coal Grove, 28-6. That loss proved to be the Hornets only regular season defeat a year ago. One team will remain undefeated once the clash between these two area powerhouse programs has ended, and it feels like this will be a game to remember for those who attend this Friday night. Kickoff in West Portsmouth is set for 7:00 p.m.